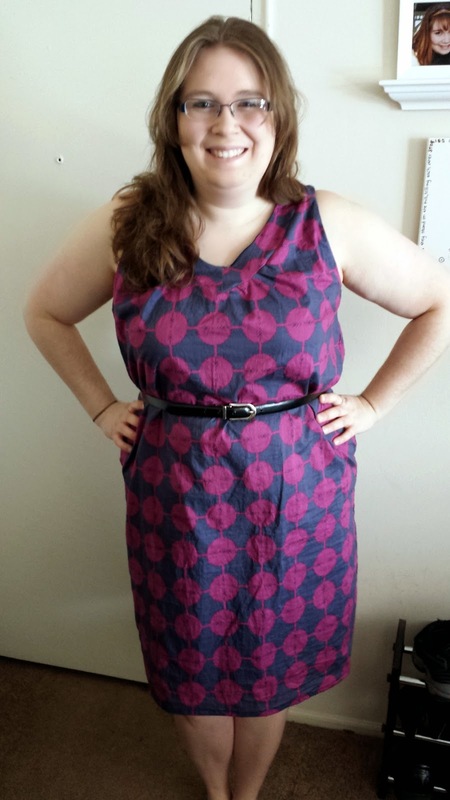 Quilty Habit: Socialite Dress - Finished! This finish was on my Finish-A-Long Quarter 1 goal list, and it was done on time! Yay! I'm linking up with Adrianne @ On The Windy Side. At long last, I finished making my first dress! Party time! Oh, and I just love wearing it with a belt. Otherwise, most dresses in this style (unfitted) look like large, floppy pillows on me. :) I'm a curvy 5'10", so dresses need to fit me well! The pattern is the Socialite Dress by Anna Maria Horner, and the fabric is a beautiful midnight blue/purple voile from her Field Study line (I fell in love with it and envisioned it as a dress about 2 years ago). Oh, and I'm totally wearing it to AMH's Mod Corsage class this Saturday (I'm still wondering if this is real life). My wonderful friend Amy had gifted me the pattern for Christmas in 2013 (she's a fab garment sewist!). In person, she graciously helped me through the beginning steps of tracing and cutting the pattern. On my own, though, I was overwhelmed by the pattern and became intimidated by the whole prospect of sewing. a. dress. 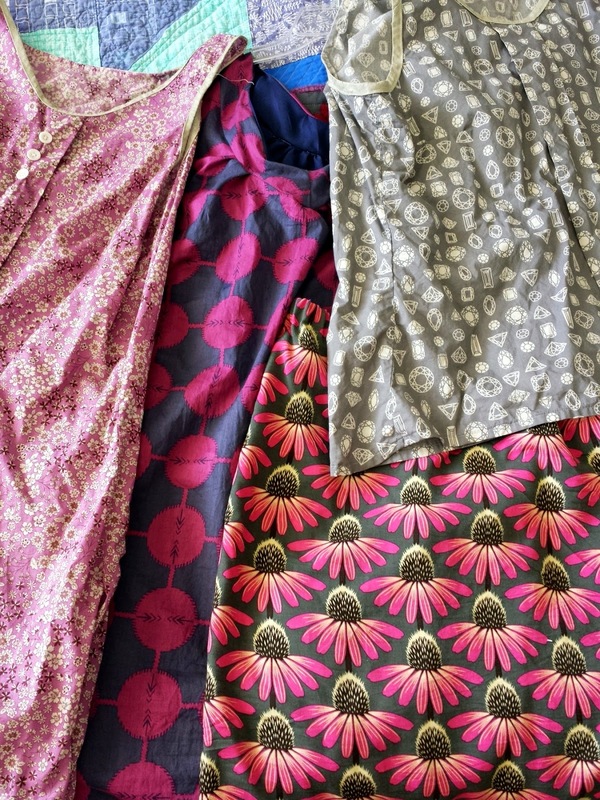 I started again, empowered, about 3 weeks ago (my first two tops [here and here] and rayon simple elastic waistband skirt [which I need to blog about] were recent successes. For those of you who are thinking about starting to garment sew - I would not recommend starting with a dress! Tops require less fabric and give you a lot or practice with all of the ins and outs of garment sewing. This is not a beginner pattern (in my opinion), and I made it as simple as possible for myself (no pockets, for example). The pattern gave a great explanation of gathering but the rest was a little murky (this visual learner could have used more pictures). I had a back and a front - so far, so good. Then, I decided to line it with a midnight blue fabric I bought at Joanns, because although the voile is dark, it is a bit sheer. This was where I ran into problems. Prewashed voile, all ready to cut into! 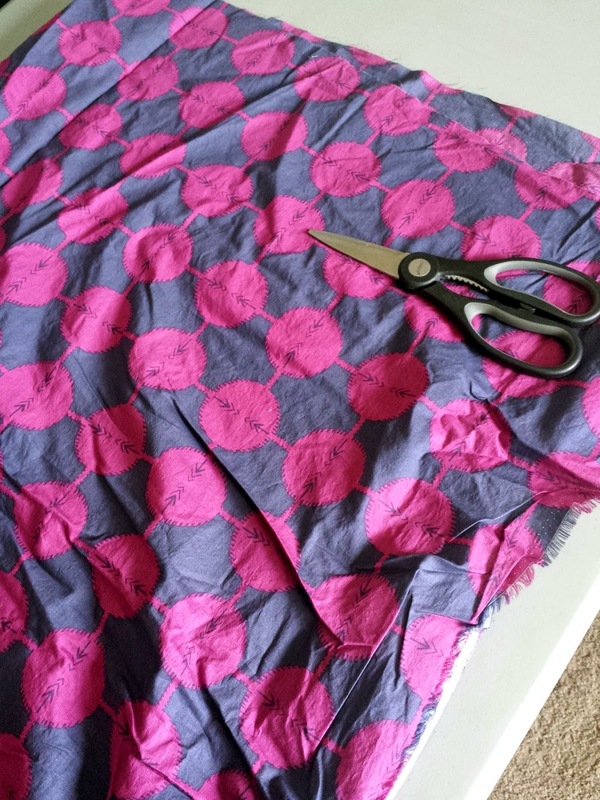 I tried following different directions online for sewing lining to a sleeveless dress. After hours of fabric wrangling, seam ripping, and consultation with guild members (thank you ladies! I am forever in your debts), the only solution that made complete sense to me (and worked!) is this one by The Slapdash Sewist. It involved a tiny bit of hand-sewing, but that's okay. Plus, Jess pointed out that I had sewn on both yokes completely backwards (oops), so that was a big problem. Now that the lining is successfully in place, the best part is that I didn't have to do any armhole facings or neckline facings. However, somehow, my lining got smaller (maybe I was supposed to make it a little bigger? ), so I cut it at points and added fabric. Improvising, just as I would with a quilt. Plus, I used French seams and no one will be looking at the lining anyway, right? :D I still have a lot to learn about linings. Any advice? Thank goodness for sewing breakthroughs. I'm really excited to wear this dress everywhere, but I will be taking a garment-sewing break for a little while, I think! Here I am, packing 4 handmade outfits in my suitcase for QuiltCon - just two more sleeps until I wake up at an ungodly hour (3 am) to catch a flight to Texas! The dress looks fantastic, and I think you are awesome for jumping in and trying so many new sewing things so you can wear handmade at QuiltCon. I slept in my own bed for the last time until Sunday night last night... it's starting to feel real! I knew that dress would be great for you! I love it! When I made mine with Melody Miller linen I miscut the skirt part and had to do the insert fabric which you dont even see. I wear mine with a thin shirt and leggings. Awe, you look so pretty in your new dress. Congratulations on a great finish. Your dress looks awesome Jess! Can't wait to see your photos from QuiltCon! Will you be at Quiltfest in March? I am planning on going one day. Having seen this dress in person at QuiltCon I can confirm it looks awesome. Great work! Tote bag for QuiltCon - check!